Cardiology is a medical specialty dealing with heart disease and disorders. The article below focuses on the average salary of a cardiologist. The heart is a complex organ. A well-functioning heart is vital to good health. Any disorder or disease associated with heart is considered extremely serious and is often life-threatening. The heart is a muscular organ responsible for pumping blood through the body by repeated contractions. It beats seventy two times a minute. It is, therefore, a precise organ, and its condition is central to health. Therefore the job of a heart specialist or a cardiologist becomes extremely important. The article below highlights the job profile and salary of a cardiologist. 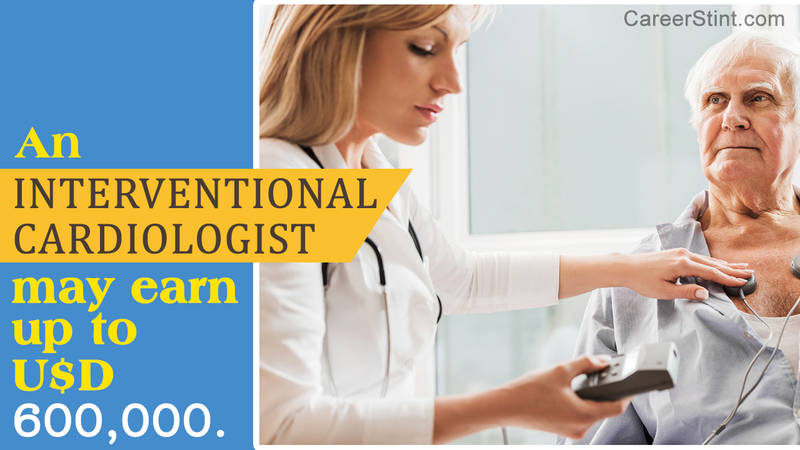 First and foremost, a prospective cardiologist must obtain a science bachelor's degree. This is followed by four years in medical school to obtain an MD (Doctor of Medicine) degree. Cardiology is a sub-specialty of internal medicine, so one has to complete three years of internal medicine training. Aspiring cardiologists need to pass the internal medicine certification exam and get certified by the American Board of Internal Medicine. Finally, one must complete three more years specialized training in the field of one's choice; depending on the specialization. After completing the specialization they need to pass another board exam to get certified in cardiology. Diagnosis, treatment and intervention of diseases of the heart and cardiovascular system are done by cardiologists. There are three types of cardiologists, non-invasive cardiologist, invasive cardiologist, and interventional cardiologist. A non-invasive cardiologist basically runs a practice from his/her office. Patients undergo diagnostic tests and are advised treatment as per their condition. The tests include ECHO's, stress tests, and EKG's (electrocardiograms). A recent development for non-invasive cardiologists is nuclear cardiology. In nuclear cardiology, the patient is injected with nuclear dye, and a high-tech special "nuclear camera" is used to take images of the heart. These images are better than other tests for diagnosing heart problems. However, if any type of surgical procedure is required, the non-invasive cardiologist will then refer the patient to another physician. Invasive cardiologists do more tests than non-invasive cardiologists often using invasive techniques. One of the main procedures that they do is called cardiac catheterization, which is done to find blockages in the arteries. The non-invasive cardiologist's time is divided between office visits and time doing these catheterizations. If there is any blockage, then the case is referred to an interventional cardiologist or another physician who may do an angioplasty or a bypass surgery as the case may require. An interventional cardiologist uses invasive tests and procedures in order to diagnose and treat heart diseases. An additional fellowship of up to two years is required of a interventional cardiologist. The interventional cardiologist is trained to perform more advanced procedures than invasive and non-invasive cardiologists. Interventional cardiologists will spend majority of their time in hospital. They will perform procedures, such as balloon angioplasty to open blocked arteries, or place tiny mesh stents into narrowing arteries, typically completing hundreds of procedures per year, including up to 300 catheterizations and up to 100 angioplasties. Additionally, interventional cardiologists also spend some time in an office, where they will consult patients beforehand and follow-up with patients after procedures. The median salary of a cardiologist, as of 2015, is between USD 300,000 to USD 400,000. The average salary seems to be around USD 350,000 per year. Compensation for non-invasive cardiologists is typically more than USD 400,000, while the compensation for invasive, non-interventional cardiologists may extend up to more than USD 500,000. An interventional cardiologist may earn up to USD 600,000. Years of experience, specialization, sub-specialty, location, and the type of facility they practice in are the factors taken into account for estimating a cardiologist's pay scale. Highly-experienced cardiologists get handsome remuneration.